Note this research was presented as a poster at the International Aerial Archaeology Conference - AARG 2011 [Poznan, Poland]. Rory McNeary and Claire Foley. Airborne LiDAR for cultural heritage management and research in Northern Ireland. Case study: the archaeological landscape of Knockdhu, Co. Antrim [Northern Ireland]. Knockdhu ["black hill' in Gaelic] is the name given to a headland that commands views of the coastal plain of Antrim and across the Channel to Scotland. The site comprises an inland promontory fort and fieldwork in 2008 recorded at least 18 roundhouses within [of which four were excavated; see MacDonald 2010]. The carbon dates returned from these excavations along with the flint tool technology observed dated the site to the middle Bronze Age, roughly 4000 years ago. While these excavations shed new light on the promontory itself a true appreciation and understanding of the surrounding landscape was still felt to be lacking by archaeologists within the Environment Agency and so a new high resolution LiDAR survey was commissioned to afford greater insight at the wider landscape level and facilitate improved Cultural Heritage Management [CHM] across the site and its environs. The Environment Agency records 42 archaeological monuments within the study area [source: NI Monuments and Building Record, NIMBR] of which 11 are Scheduled Ancient Monuments [SAMs]; these SAMs comprise an approximate area of 0.1km², which is only c. 1.1% of the total study area. 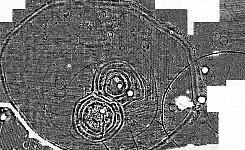 Inspired by the results achieved by the FliMAP LiDAR survey of the Hill of Tara, Co. Meath by The Discovery Programme (Corns and Shaw 2009) NIEA commissioned Fugro-BKS Ltd. to carry out similar survey[s] that would supply the agency with data at a target resolution of 60 points per m² [a notional ground spacing of 12.5cm] from which a Digital Surface Model [DSM] and a Digital Terrain Model [DTM] might be generated. Initial data processing was carried out by Fugro-BKS Ltd. Subsequent data analysis was carried out at the School of Environmental Sciences, University of Ulster on behalf of NIEA. Preliminary analysis has revealed a wealth of new archaeological features as well as better quantifying and qualifying the known record. Stand-out discoveries include 50 possible new hut sites on the promontory itself and the large number of potential open-caste mining scars and trackways. In addition the LiDAR "Local Relief Model' [LRM] in particular has allowed us to better delineate relict boundaries, cultivation ridges, settlements, enclosures and cairns (see Hesse 2010). 3-D visualisations have aided our understanding of monument morphologies and provided a better appreciation of their landscape siting. This new information is being incorporated into the existing NIMBR and recommendations made for protection. A further benefit of the LIDAR data is that it has revealed potential threats to the cultural heritage, such as, arterial drainage, overgrazing, erosion and inappropriately sited development; all of which can now be better managed in the future. This research has been Cultural Heritage Management [CHM] led with the emphasis being on the verification and extension of the existing NIMBR and the identification of threats to it. 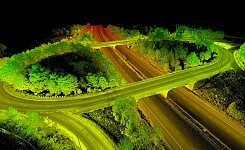 To this end the LiDAR survey has been a success. However, the full research potential of the data-set has yet to be realised and further data analysis and integration in conjunction with documentary research and field verification is ongoing. 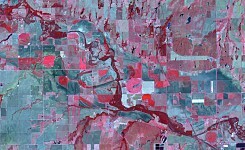 The LiDAR data will be utilised as part of a wider landscape driven study examining themes, such as, resource exploitation, movement and control, territoriality, rural settlement, landuse and the changing nature of the agricultural economy. 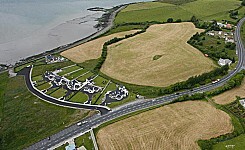 The author is grateful to Built Heritage [Northern Ireland Environment Agency] for having provided the LiDAR data. MacDonald, P., 2010. Knock Dhu, Ballyhacket, Co. Antrim, Promontory Fort, summary excavation report in Monuments and Buildings Record (MBR).